We don’t know how these companies will react when candidates start to want to submit GRE scores instead, but given that we haven’t yet heard of a bank or consulting firm asking for “GMAT or GRE” scores, it’s a safe bet to take the GMAT. If you made it through that gauntlet without a definitive push towards the GMAT, then you’ve got a tougher decision to make. I’m going to split people into two broad categories here: those who haven’t started studying yet (or barely started studying) and those who have been studying for one test for a while and are considering a switch to the other test. If you’re relatively new to all of this, then you’ll need to try to assess your strengths and weaknesses based upon how you did on various subjects in school. Are you better at vocabulary (GRE) or grammar (GMAT)? Do you also think that better area would be easier for you to improve even further? Are you better at geometry and data interpretation (emphasized more on GRE)? Or are you better at story problems and number theory (such as divisibility, odds and evens, etc.)? The latter is emphasized more on the GMAT. Do you hate the reading and analysis stuff that shows up on the verbal section? If so, you’re stuck: both tests cover reading comprehension and arguments. Both tests also require you to write an essay. On the GRE, you’ll actually write two essays. On the GMAT, one essay was replaced with the Integrated Reasoning section (a mix of quant and verbal). This IR section may eventually become a factor in deciding which test to take, but right now, the IR score isn’t used much in the admissions process. Both tests also put you under pretty serious time pressure. Some people like the fact that you can jump around among the questions in one section on the GRE; on the GMAT, you have to answer each question to get to the next one and you can’t go back. In practice, you actually won’t have time to go back to many (if any!) questions on the GRE, but knowing you have that option can reduce stress during the test—something to consider if you have a history of anxiety during high-pressure tests. First, you need to figure out whether a switch will be worth the additional cost (time and money). It may just be that you are burned out and could use a break. Is the current test “fatal” for you in some way that the other test wouldn’t be? For example, if you’re struggling with vocab, but much better at grammar, then a switch from GRE to GMAT might be wise. If GMAT stories and number theory are driving you crazy, but you actually kind of like geometry and graphs, then maybe you should switch to the GRE. If, on the other hand, you’re struggling most with the reading (passages and arguments), or you aren’t a fan of algebra, then switching tests isn’t going to do much for you, since both tests cover those topics. If you do switch, expect to start at a lower level than your scoring level on the current test; after all, you’ve been studying for a while and made at least some progress. The question is whether the lower starting level is still high enough to mean that you can reasonably lift your score beyond the equivalent scoring level of your current test. How to tell? Take one week to study for the “other” test. If the “other” test is the GMAT, study data sufficiency, sentence correction, and timing. If the “other” test is the GRE, study quantitative comparisons, the two vocab question types (sentence equivalence and text completions), and timing. If you just can’t decide based upon what we discussed earlier, you can follow a similar path to the one I described in the last section: take two weeks to study, one for each test (and take two practice tests). If your percentile rankings are within 15 to 20 percentile points, then you don’t have a major advantage on one test versus the other. If your percentile rankings differ by more than that, then you might have a major advantage on one test. You also need to take into account whether you had any major timing problems that might have significantly hurt your score. On any standardized test, timing is a major factor. If you run out of time on one section of one of the tests and don’t finish all of the questions, your score will drop (in some cases, quite a lot). This is really just due to messing up the timing, though—not to a fundamental disadvantage on that particular type of test. You have to master timing no matter which test you take. If the timing was okay on both tests, though, and you see a very large (> 20 percentile point) difference in scores on the quant or verbal sections, then you may want to consider studying for the test on which you earned the higher score. 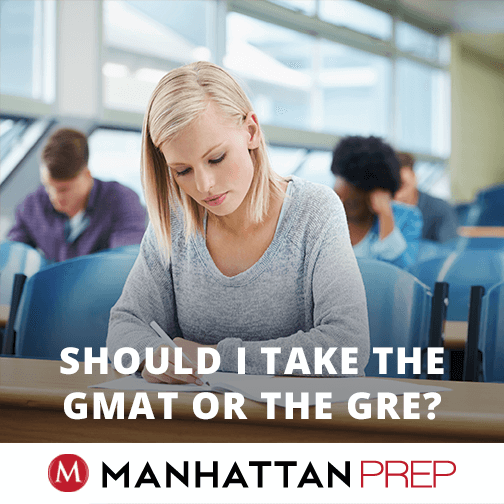 In later articles, we’ll talk about what to do if you decide to switch from the GRE to the GMAT or from the GMAT to the GRE. Until then, happy studying!